Controlled drainage, commonly referred to as drainage water management, uses a control structure to manage a drainage system’s outlet height. By controlling the outlet height the manager can control the time of year and volume of water that is drained. Restricting flow during the periods when drainage is not necessary reduces the amount of tile transported nutrients by decreasing the volume of water discharged. Increases in crop yield can be realized if water is able to be held back for the time of year when crops operate at a water deficit. Managers should follow a drainage water management plan prepared specifically for their field and drainage system. 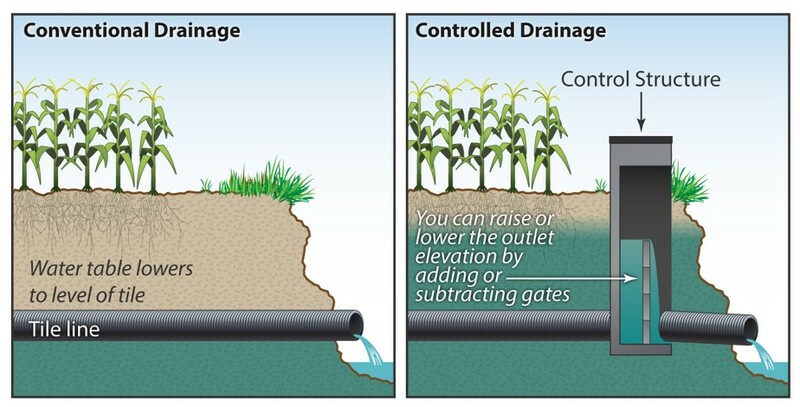 Controlled drainage works when there are management zones within a field with slopes <1%. The larger the zones with slopes <1%, the more economical the practice.Click here to view the controlled drainage suitability map created by Transforming Drainage project team. A structure that controls the outlet height sits on the main at the edge of the field. Subsurface float valves can be used in the field to avoid in field obstructions. Laterals are installed on the contour which potentially calls from more connections and smaller runs during installation. Nitrate reductions of 33% can be realized due to decreased flow volume and potential denitrification. Ortho-phosphorus exports are also decreased with the use of controlled drainage. Controlled drainage systems are eligible for financial assistance through the NRCS EQIP program. There are Conservation Practice Standards available to help pay for the control structures, additional sub-mains that may be needed to manage the water levels, and for the drainage water management plan. Your state may also have state or private funding available. For more information, please refer to the ADMC Financial Assistance page.